Derby County have completed the signing of out of contract defender Russell Anderson. As reported earlier on Derby County Mad Russell will go straight into the Rams side for Saturday's game away to Peterborough. His contract is for the rest of this current season. Nigel Clough has taken the former Sunderland player after injuries to both Dean Leacock and Miles Addison has stretched the Rams squad and the 31 year-old has plenty of top class experience with over 300 appearances for Aberdeen, where he was Captain before a £1m move South of the Border to Sunderland. Anderson also has 11 International caps for Scotland. 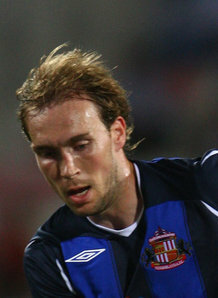 The move not only benefit's the Rams but enables Anderson to get back into football following over fourteen months on the treatment table following a cruciate ligament injury whilst with Sunderland.